As you approach the village in which I live, the peak of Mount Abraham rises above the Green Mountains in the near distance. 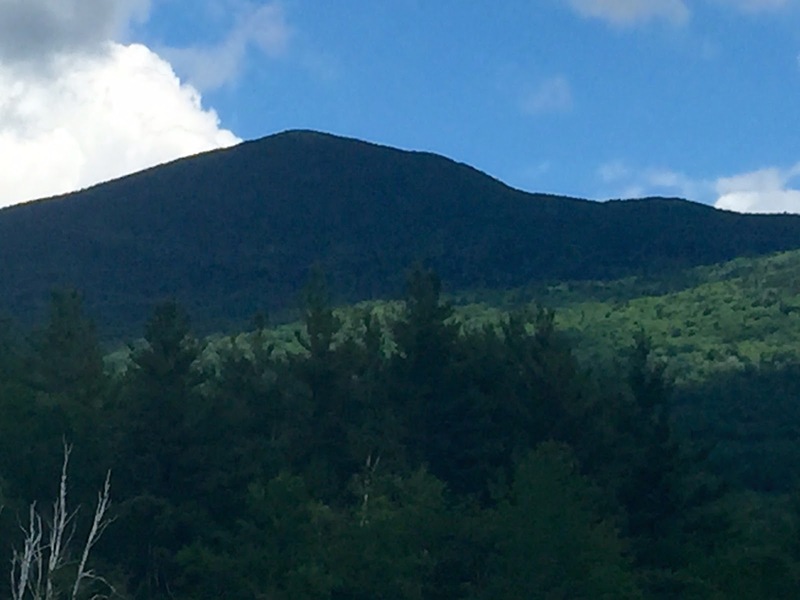 At 4,006 feet, it’s the fifth highest peak in Vermont, and my favorite one to climb. I climb it every year, not only for the breathtaking 360 degree view at the top, but also for the climb itself. Climbing mountains is used metaphorically in all kinds of literature and music, and for good reason: I made it. I did it. We did this together. I’ve reached a point in my life where I now have new perspective and clarity about where I’ve been and where I’m going. Standing at the top of Mount Abe, as locals call it, has brought all of these feelings to mind, and more, depending on the year in which I’m climbing it. 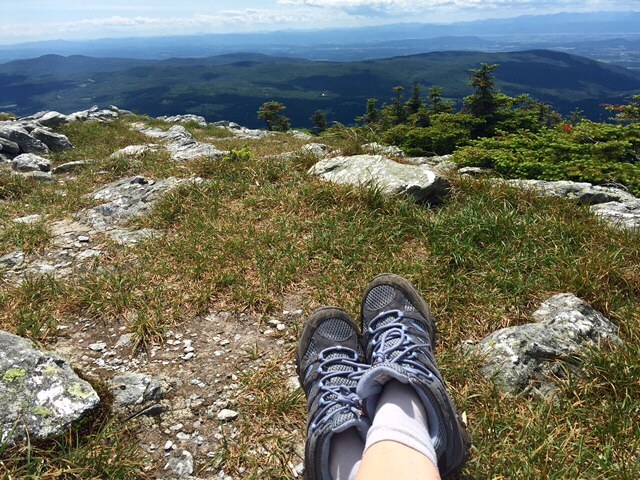 For someone who struggles with a fear of heights, as I do, standing on a mountaintop also can evoke anxiety. But for some reason Mount Abe doesn’t, even though for the last half mile or so you’re climbing up bald rock, often on your hands and knees. Maybe it’s because there are no cliffs at the top I could fall off of. 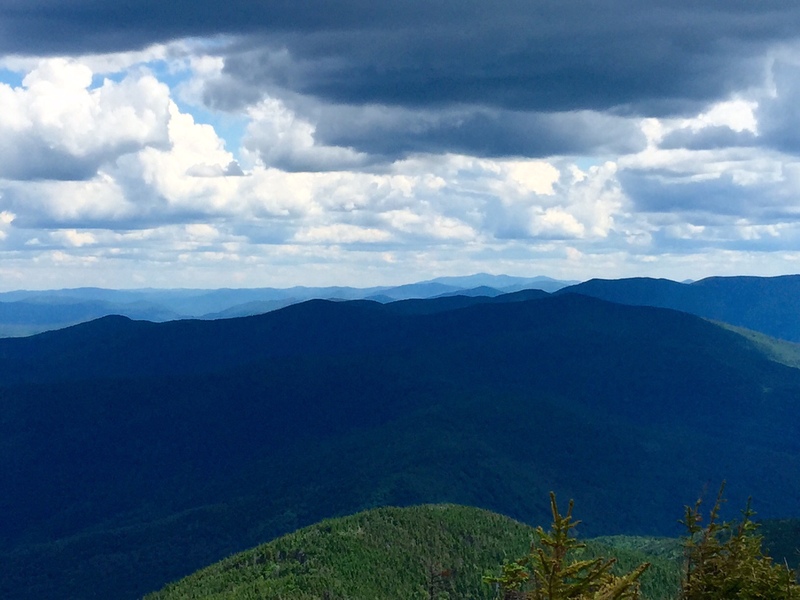 Or maybe it’s because I’ve climbed this particular mountain so many times, leaving from Lincoln Gap and steadily ascending the Long Trail for 2.6 miles until I reach the summit. The first time I climbed it was with Chris when we were newly married. We were with our friend Steve and his former wife, and it was cold and windy at the top so we huddled in the roofless stone shelter to avoid getting a chill. 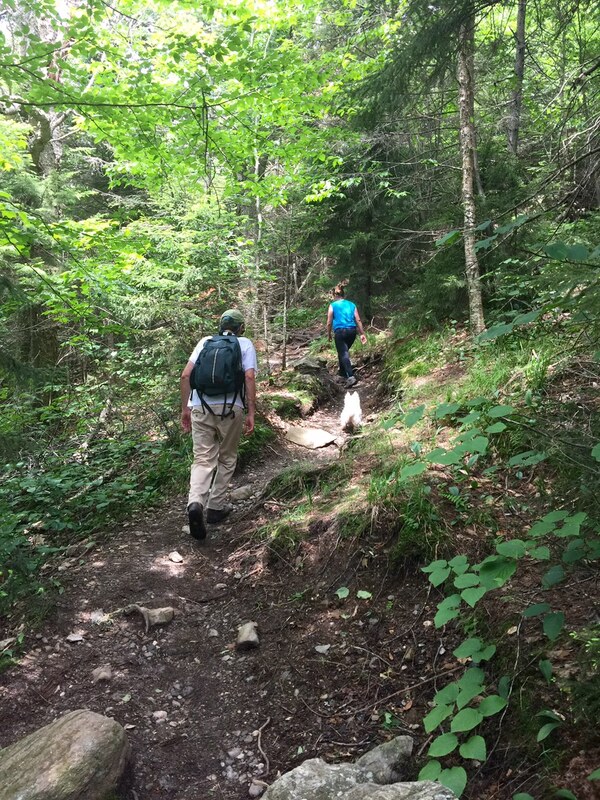 We’ve since climbed it with babies in backpacks, and with our daughters as young children, excited and determined to keep up. 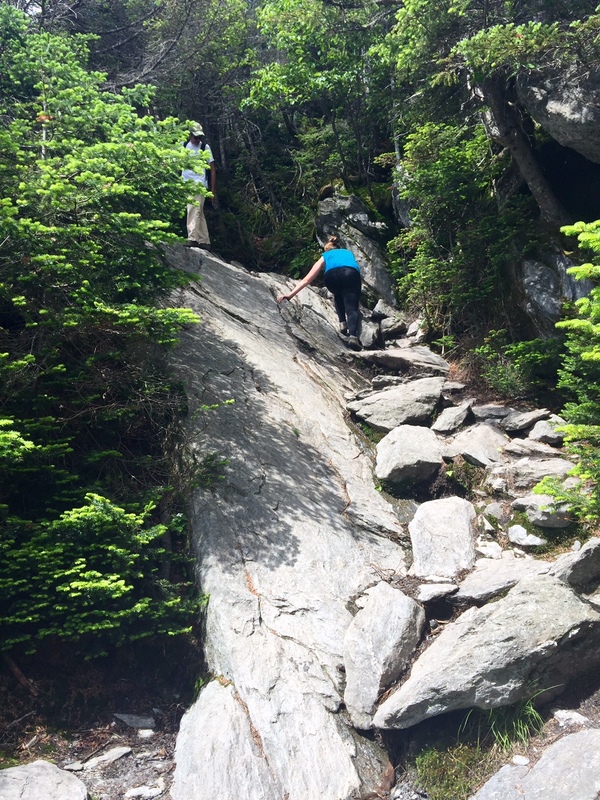 We climbed it for our friend Pam when she was dying of cancer. Faye chose to climb it to celebrate her tenth birthday. We often climb it for Father’s Day, or on Chris’s birthday in August. We’ve climbed it in the fall when the foliage on the surrounding hillsides is achingly beautiful. We’ve climbed it in light rain that turned to a thunderstorm forcing us to turn back. We have friends who climb it in the winter on snowshoes and in the dark to see the sunrise, but we have yet to attempt those. 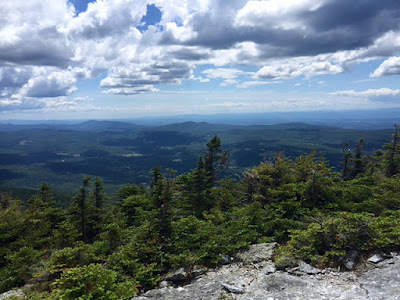 This year, the day we climbed it was a picture perfect summer day: blue skies with puffy clouds, no humidity, and a temperature hovering in the mid-70s. The trail passes through three natural communities. First, a verdant spruce fir forest with ferns and wildflowers blanketing the floor. Next, near the top, krummholz with its distinctive miniature, wind-bent trees. And finally at the summit above the tree line, alpine meadow—low growing shrubs, rock dappled with lichen, open to the elements. When we reached the top, we sat on the rocky ground and talked about the last time we reached this summit—last summer with Isabel—and about the coming year. Faye will be a senior and is thinking about colleges. Isabel, who’s been with us every other year we’ve climbed Mount Abe, is an intern in DC this summer. They both have many mountains yet to climb. But so do Chris and I. Our dog Callie came along too, as she usually does. 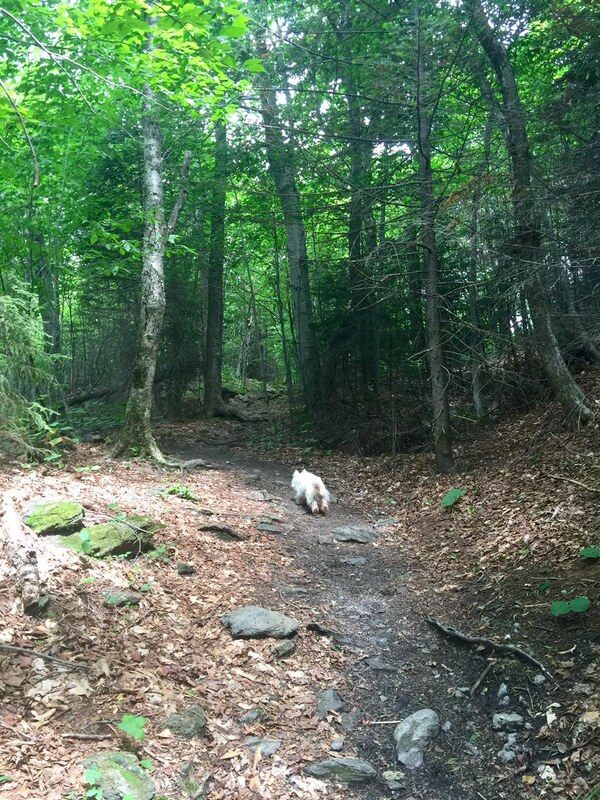 She’s a hardy little West Highland White Terrier and hiking is in her blood (although she needed some assistance on the bald rock). I often imagine her ancestors exploring the Scottish Highlands as she scampers along beside us. Her former sister Cooper, a Golden Lab mix, used to accompany us for many of her sixteen years. Both have been guilty of breaking the rule at the top, I have to confess, about not stepping on the delicate tundra vegetation. The way down Mount Abe, for me, is usually harder than the uphill. Those who have knee issues will understand why. 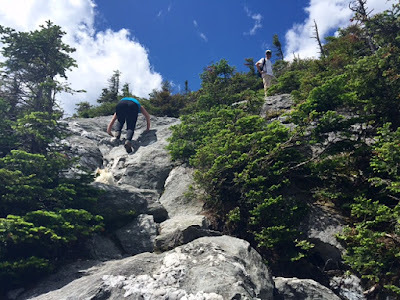 Climbing a mountain, especially one with as much bare rock as Mount Abe has, is much more challenging than hiking on winding dirt trails; the bare rock makes you very aware that you're scaling the surface of a mountain. 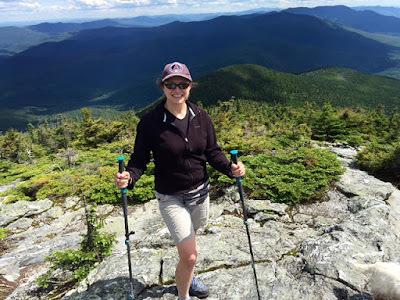 I recently bought some trekking poles, though, and what a difference they make. I have no idea why I waited so long to acquire some poles, but they will accompany me on every hike, big or small, from now on. By the time we’re nearing the bottom, our bodies feel the sense of satisfaction and exhaustion from having pushed ourselves beyond our norm. We’ve also worked up quite an appetite. 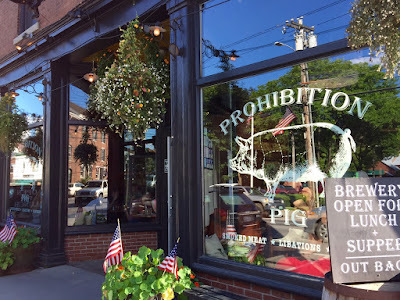 Food always tastes better after exertion, and a few years ago we discovered the ideal place to enjoy a meal following Mount Abe: Prohibition Pig in Waterbury. It’s about a 30-minute drive down into the Mad River Valley on the other side of the mountain range, and what awaits at Prohibition Pig lives up to its intriguing name. 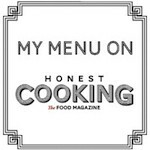 This restaurant gives the term foodgasm new meaning, especially if you have an appreciation for Southern food like I do—Southern food of the freshest, highest quality possible, made with local ingredients. Pork rinds, hush puppies, and fried pimiento cheese are all on the menu, along with Yankee-Southern mashups such as cheddar grits and maple baked beans. OOhhhh Baby. Kale Salad is also on the menu, but this is not the place to order that (although I’m sure it’s excellent). If I’m going to go with a salad post-hike, it’s the Crisphead wedge that calls my name, covered as it is with bacon, Bayley Hazen blue cheese, and Mad River Valley Ranch dressing. Chick’n Biscuits are another favorite, but since I had those the last time I was at Pro-Pig I decided to forego them this time for the specialty of chopped pork barbecue, “Eastern North Carolina style,” made from local Snug Valley whole hog. I grew up below the Mason-Dixon Line and went to college in North Carolina, so this particular style of comfort food is dear to my heart. 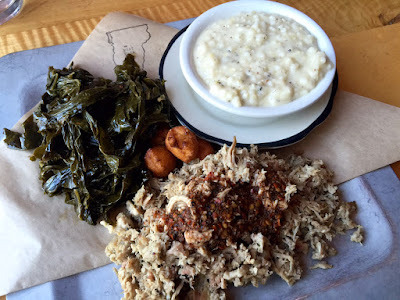 The Chopped Pork BBQ Plate features a pile of succulent pork seasoned to perfection with hints of vinegar and spice. It comes with hushpuppies and a choice of two sides; it was tough to choose but I went with the traditional collard greens (to keep it healthy) and grits. Although I’ve been told that true Southerners only eat grits for breakfast, I prefer mine with dinner, and these made good company with the juicy pork. And I mean goooood. 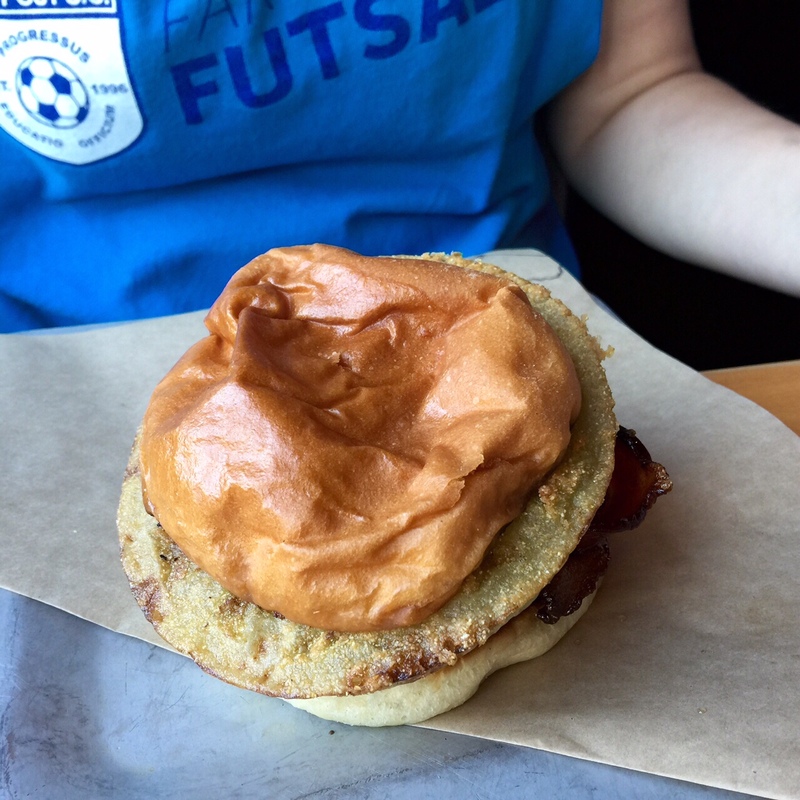 Faye likes a quality burger, and Prohibition Pig’s House Burger comes topped with a fried green tomato, pimento cheese, and bacon. Add to that shoestring fries and she was a happy girl. 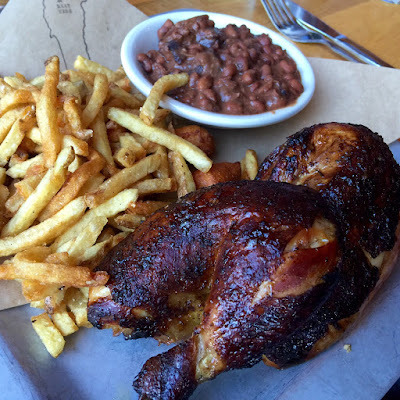 Chris forewent his usual hankering for pork barbecue (he lived for two years of his life in North Carolina as well) and opted for the Pit Smoked Chicken. Burnished to a golden brown and deliciously smoky, this chicken is not your everyday chicken. Black eyed peas, hushpuppies, and shoestring fries rounded out his plate. All washed down with some local beer (Waterbury is thought by some to be the center of the craft beer universe), and Italian Barbera for me. In the end, all that was left was a stray collard green. We can vouch that Pro-Pig’s desserts are swoon-worthy as well (especially the Key Lime Pie), but tonight we were more than satisfied. Many mountains yet to climb. And many meals to savor. Thanks Porter. Can't believe I've never done that hike with you. Maybe this fall? I love your love of life, Sheila. Thank you for sharing this peak experience with its literal and metaphorical magic. From one gourmande to another, Linda!